"Happiness is FRESH MANGO PULP with ICE"
I am a mango lover, mango fan since I don't know when.... may be the day I was in my mother's womb. I love mango to core of my heart and when I came to know about the Mango Festival, I could not stop myself. As, it is summers and lots and lots of Mangoes everywhere but still the hunger for mango remains the same. My hunger for more MANGO took me to "Khandani Rajdhani" in DLF Place,Saket, Delhi. Just check what I had.... MY GRAND MANGO THALI!! Hmmm....where should I start with? With this or that or that one? Ok.... Lets start with the ambiance, The ambiance is nice and soothing. Oh! I missed... when you enter the restaurant a person will give you haldi(turmeric) and chandan mix to put as tika which is very soothing. This helps you to relax and clam down before having food. Now lets start with the cuisine, talking about the drinks, first we were served "Chanch". The chanch was perfect in taste with jeera in it as it helps in digestion. I like chanch when it is served chilled. Then we had Panna which was amazing to taste, it reminded me of the one which my mother used to make. The best part of Panna was it was neither too sour nor too sweet and had pudina(mint) in it which is very refreshing.Perfect balance of all ingredients make things great. 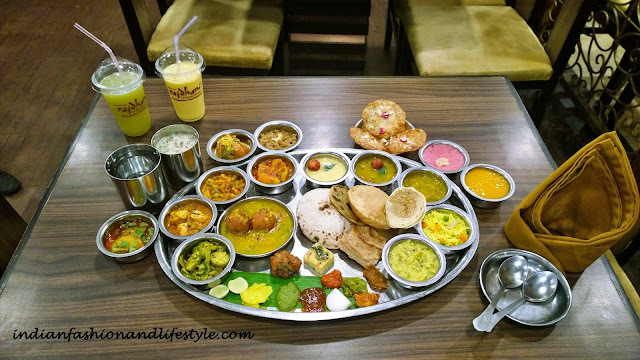 Talking about the main course as you can see there is a huge list like the Mango Dal Dhokli, Fajeto, Raw Mango & Onion Bhajia, Mango Pulao, Goonda Kairi, Aam ki Lunjee, Mango Curry, Mango lassi, Amrakhand, Aamras-Poori etc etc. 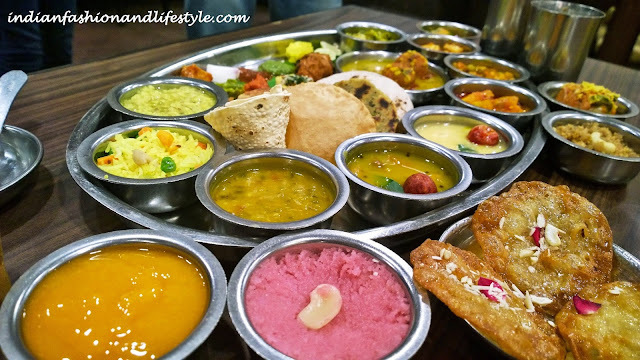 Among them I love Aamras-Poori, Panna, methi and mango ke theple and Gujrati Mango Curry. Dal bati churma and strawberry raita was simply mouth watering and love it. 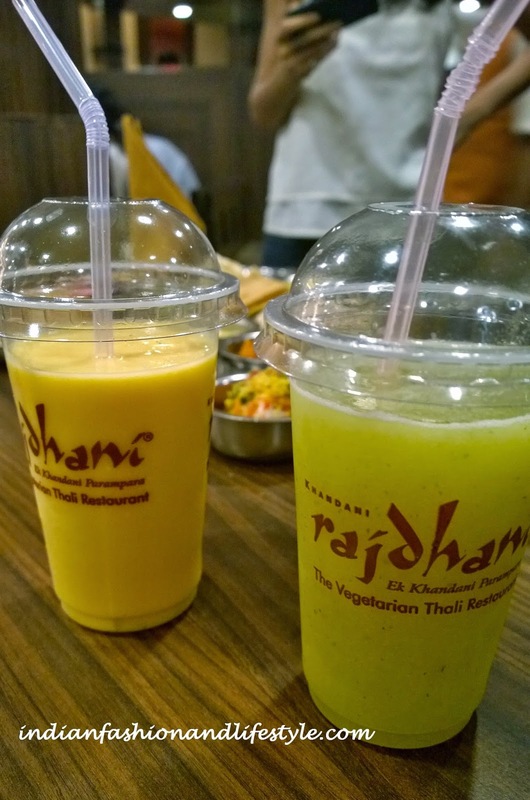 A special mention about the Mango Lassi, just one glass and you don't need anything else in the world. 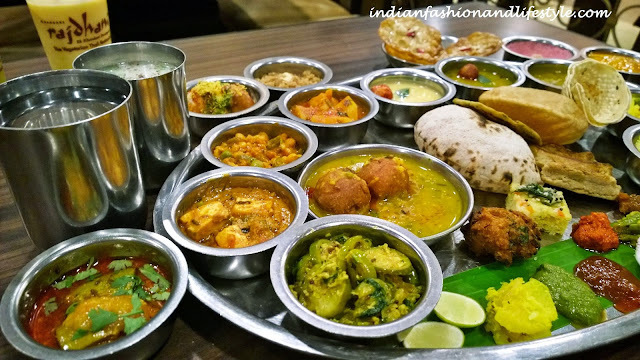 The quality of the food served is very good and the way it is made by the chef is remarkable. If you are a MANGO LOVER like me then this is the place you should check out. Mango Festival is on going till 15th June 2015.